‘Trapped in History’, a solo exhibition of sculptures by Jaco Sieberhagen was hosted from 22 May to 6 June 2008. Contemporary art, by definition, should reflect and comment on present-day society. Many artists approach these issues from a personal, internalised perspective and frequently produce individualised artworks that are highly subjective, thereby limiting their potential audience. In his quest to address a universal audience, Jaco Sieberhagen juxtaposes contemporary socio-political issues with parallels in history. His sculptures do not offer conclusions but instead ask questions – he questions man’s sacrificial pursuit of progress and materialism and the violent dominance of nature and his fellow man that accompanies this persuit. In the ‘Coffle’ series, Jaco grapples with James Baldwin’s statement that ‘People are trapped in history and history is trapped in people’. By using the haunting imagery of the slave trade as a reference, he comments on how modern man not only enslaves others, but also enslaves himself. As an introduction to the ‘Being’ series, the artist states: ‘Being and becoming have more to do with where you are going than where you are at the moment’. This statement rings true for both the ‘King’s High Tea’ as well as the ‘Coffle’ series. The ‘King’s High Tea’ series deals with man’s violent approach towards nature throughout history, by juxtaposing historical transgressions with current practices. Jaco highlights how our familiarity with these violent transgressions has dulled our awareness and comprehension of them. 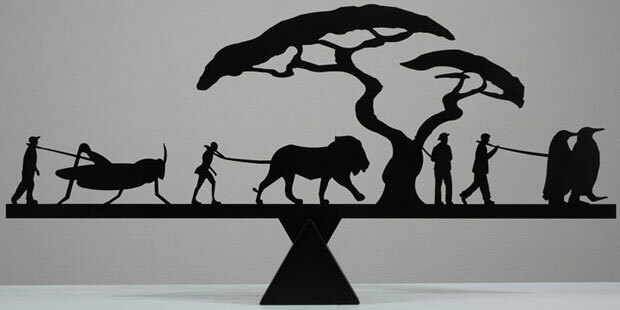 Throughout the different series of steel sculptures that he has created, starting with the ‘When we were Children’ series (2004) and the ‘Balance’ series (2005), Jaco has addressed every theme in an original and thought provoking manner. He has managed to develop authentic and fresh ideas and commentary, which he has presented in a novel way. This refreshing but serious approach to contemporary issues deserves our attention, thoughts and consideration regarding the choices we make – it illustrates and communicates the consequences of our actions towards Man and Nature and the responsibilities that lie with each of us. In the final analysis, all of us, collectively and individually, are defined by where we are going and not by where we are now.